The Thanksgiving holiday was much needed, and it went by much too fast! I enjoyed time with my family, with lots of rest and plenty of food. 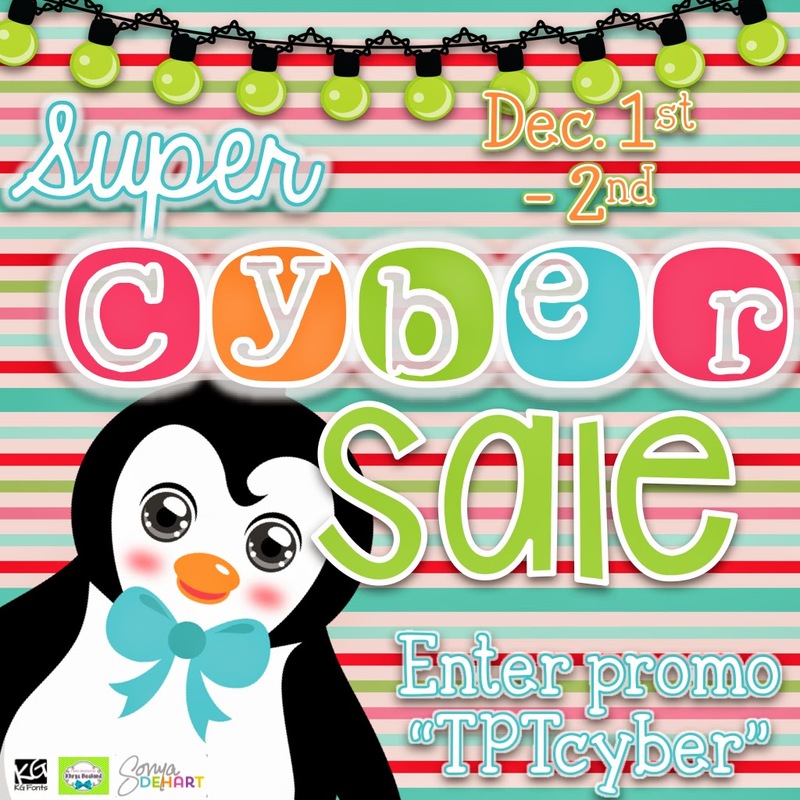 We are moving quickly on to Cyber Monday and the big Teachers Pay Teachers site-wide sale. My entire store will be 28% off during the sale! 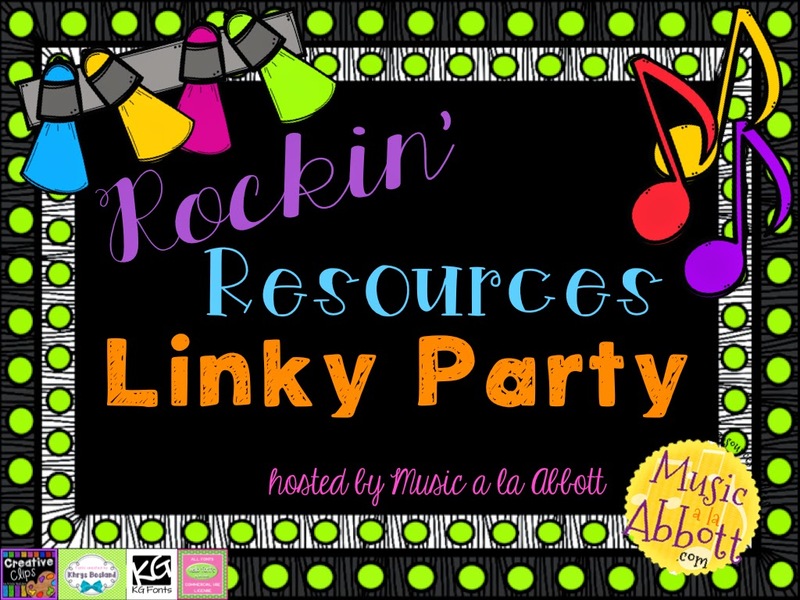 I am joining in with Music a la Abbott's Rockin' Resources Linky Party today! The party is to blog about one product from your own store and two products by other TpT sellers. Write the Room activities are quite the rage in the K-1-2 classrooms in my area. When I saw C Major Learning's Write th' Room Halloween Pirate Music Edition, I thought I it was a brilliant way to bring this regular classroom activity into the music room. My own students struggle with vocabulary in general, and accurately naming instruments in the music room. 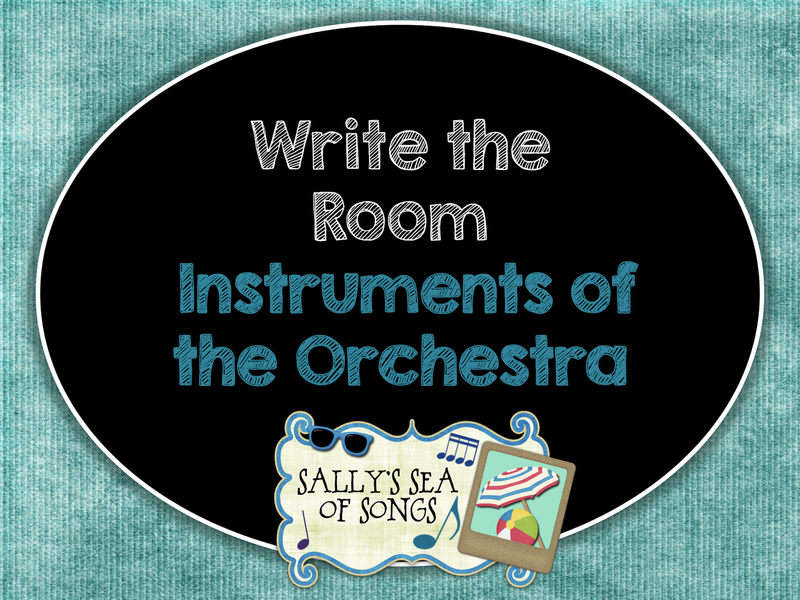 I decided that a Write the Room activity might be just the thing to allow the students to work with the proper names of the instruments in a meaningful, but non-threatening way. My original intent was to create 20 pictures of instruments and 20 labels for students to copy. Simple. Then I began to see many, many possibilities for learning and assessment! 1. Post the labels next to the corresponding picture. Write the words and practice reading them. 2. Hang the label cards only. Write the word and practice reading them. Draw a picture of the instrument. 3. Display the pictures with their label. Give students a sheet with only pictures of the instruments and ask them to find the matching label and copy down the instrument name. 4. Focus on one family at a time, or mix them up! 5. Number the picture and label cards, then hang them separately around the room. Students match the labels with the correct numbered picture. 6. Ask students to find an instrument from a specific family, such as woodwind family, write the name and draw a picture of the instrument. I ended up with 165 pages of pictures and student worksheets! Whoa! 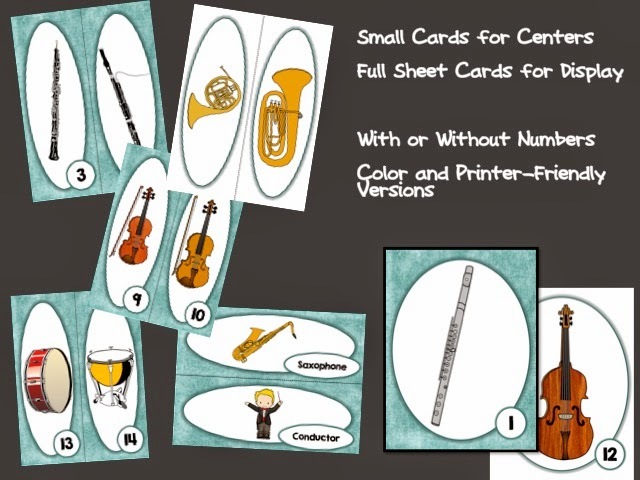 There are full sheet and half sheet picture cards, instrument name labels, numbered and unnumbered, color background and no-color background, and many combinations of these choices. Please visit my store to check out Write the Room Instruments of the Orchestra. While I am writing about instruments of the orchestra, have you seen Jenna Hudson at Sew Much Music's Instruments of the Orchestra Flipbook? 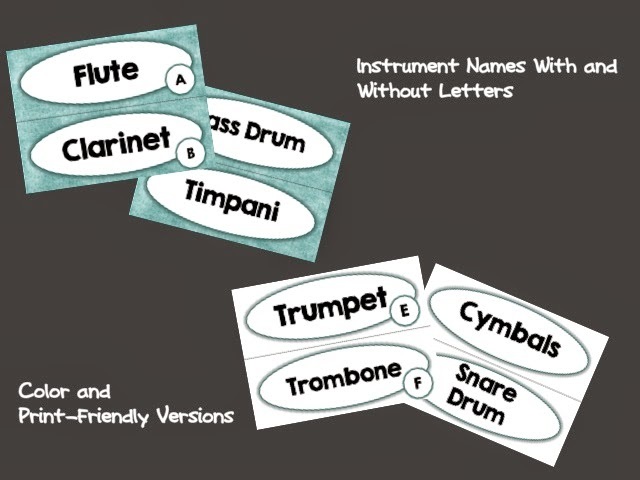 This is another great way to get the instruments and their proper names into the hands of students. 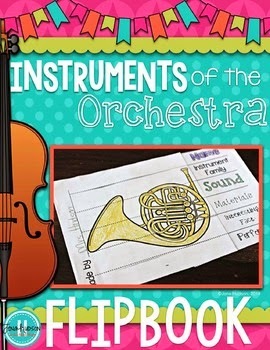 These books allow students to think about and record the characteristics of the instruments, color the instrument picture and compile this into an interactive book. I have used the composers flip books, too. These are great products! Finally, I would like to highlight a FREEBIE that I discovered from Teaching in the Tongass. A Note from the Kindness Elf is such a sweet idea! The Kindness Elves work in a manner similar to the Elf on a Shelf, except that they suggest acts of kindness and encouragement to be performed during the day. These little notes can be printed out and completed with an activity to be completed that day. "Let's see if we can make someone smile by...." and "It would warm my heart if you...." are two of the delightful sentence starters. 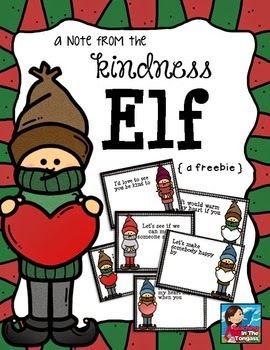 The Kindness Elves clipart is also free and available here. Don't forget to leave feedback on all of your previous TpT purchases to earn credits on your sale purchases! I love orchestra resources. 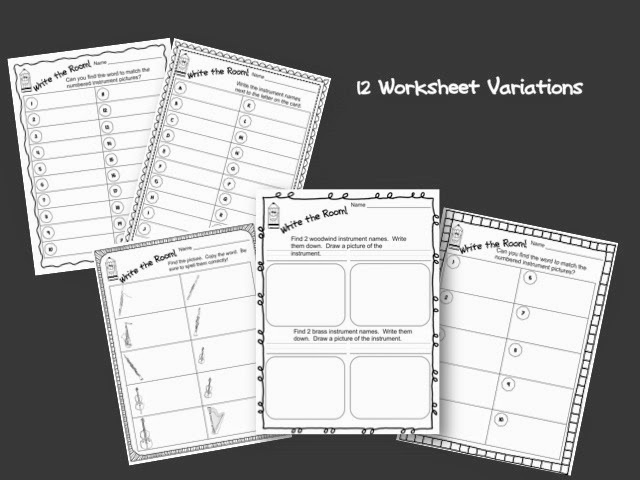 Your write the room activity looks like it will be a big hit with students!